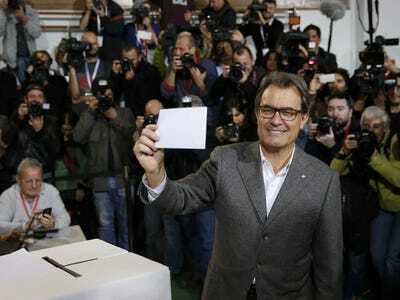 REUTERS/Paul HannaCatalonian president Artur Mas voting in Sunday’s unofficial referendum. Chinese Inflation Is At A 5-Year Low. China’s annual consumer inflation remained at a near 5-year low in October at 1.6%. South Korea And China May Have A Trade Deal. South Korea said it has “effectively” reached a free trade agreement with China that will remove or sharply reduce barriers to trade and investment between the two global trade giants. 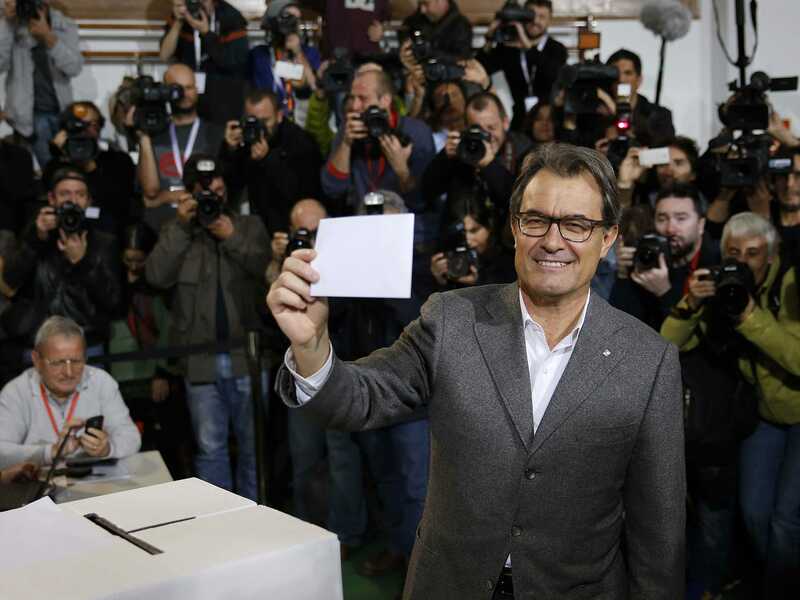 An Overwhelming Number Of Catalans Voted For Independence. Nearly 81% of 2.25 million Catalans who participated in a simulated referendum Sunday said they wanted autonomy from Spain, according to preliminary results. Russia Signed Another Big Gas Deal With China. The Russian and Chinese governments have signed another significant gas deal, after an earlier agreement this year, according to the Financial Times. Heavy Shelling Picked Up Again In East Ukraine. Shelling around the eastern Ukrainian city of Donetsk increased strains on a two-month-old ceasefire between Ukrainian government forces and pro-Russian separatists on Sunday. Samsung Is About To Invest $US3 Billion (£1.89 Billion) In Vietnam. A subsidiary of South Korea’s Samsung will be awarded a licence to invest $US3 billion in a mobile phone plant in northern Vietnam, the second such facility in the country, a state-run newspaper said on Monday. American Airlines Staff Rejected A Contract. American Airlines flight attendants narrowly rejected a joint labour contract on Sunday, in a defeat following the merger of American and the former US Airways last year. Panasonic Is Considering Expansion In Europe. Japanese electronics conglomerate Panasonic Corp is considering M&A deals as a way to bolster its position in the European white goods market, its chief executive said on Monday. European Investor Confidence Figures Are Coming. Sentix investor confidence figures are out at 9.30 a.m. GMT, with analysts expecting a modest improvement in November’s headline figures. Hong Kong And Shanghai’s Stock Exchanges Are About To Get A link. A delayed trading link between Hong Kong and Shanghai’s stock exchanges will start on Nov. 17, the Hong Kong exchange announced Monday.